Every year we hope to surprise our vendors with a little thank-you treat. Something just for them, for being so awesome and working so hard to help DUCF be an overall success. We like to sneak some “traditional anniversary gift” themes somewhere into our show each year, and for this year, the 7th, the theme would be “Knit and/or Copper”. Knitting was cleverly woven into Jason Gibner’s poster art . 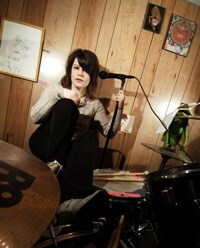 For copper, our sponsor and long time pal, Scotty Hagen of Bellyache Records really came through. 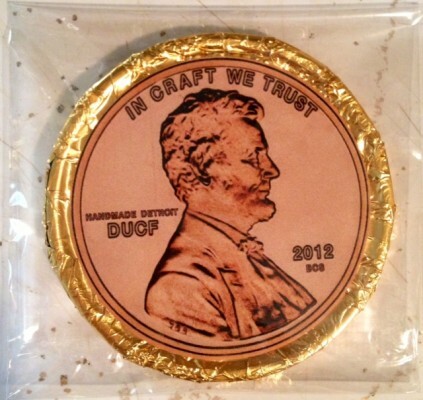 He created a DUCF chocolate “penny” coin for our vendors, 100 in all! Releasing records is his main gig, candy is a true passion and providing quality goods is a standard. Thank you, Scotty for your undying support of our local rock scene, being a DIY business person to look up to and for once again being a sponsor this year! We’ll be watching for new BCS releases in 2013!